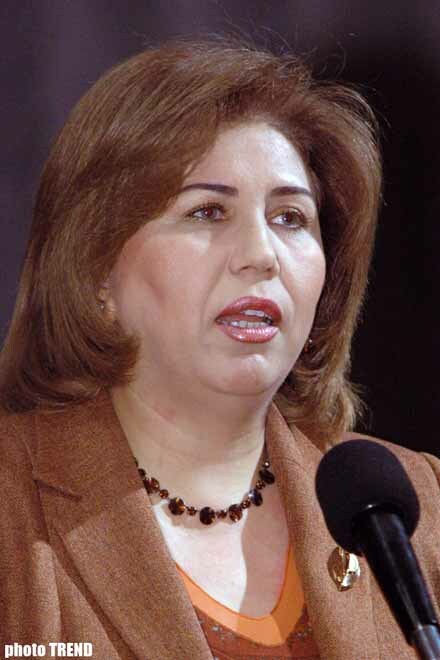 Mass media representatives should follow the supremacy of law in their activity, Bahar Muradova, Vice-Speaker of the Milli Majlis (Parliament), told today commenting the thoughts of some MPs relating pressure on the print in Azerbaijan, Trend reports. The Vice-Speaker pointed out that this issues is exaggerated as before. The law supremacy principle must be the highest priority in each democratic society. Each of us should respect the supremacy of law. I admit those challenges that Azerbaijan must have the freedom of law and press like any other country. But, at the same time, I would also like to hear that media representatives follow the supremacy of law in their activity, she said.
. According to her, that is not right. Today, many respected people are being subjected to insults and claim. But why is there nobody in this hall who could raise an issue on protecting them. They are a part of our society, are not they? she said. She touched upon an issue on mentioning ANS Group of Companies and Azadlig Newspaper (Freedom). According to her, the work of the both bodies was appreciated Regarding the expulsion of the paper Azadlig from its editorial office, I wish all our papers were provided with editorial offices. But what should we do if they have no documents confirming their rights on these offices? she said. Mrs. Muradova also pointed out that having functioning in one building and one editorial office for 14 years, Azadlig could privatize its office within the legislation. If the paper has not done it, then there is no need in blaming the authorities and exaggerating this issue she underlined.